COVER by Carmine Infantino and Klaus Janson. This issue went on sale one week after Crisis on Infinite Earths #2. 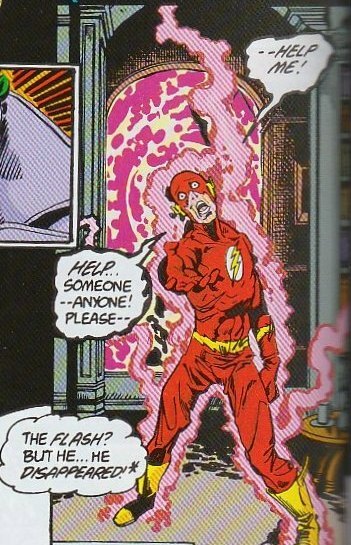 Flash fans had to be wondering about this famous sequence with Batman. 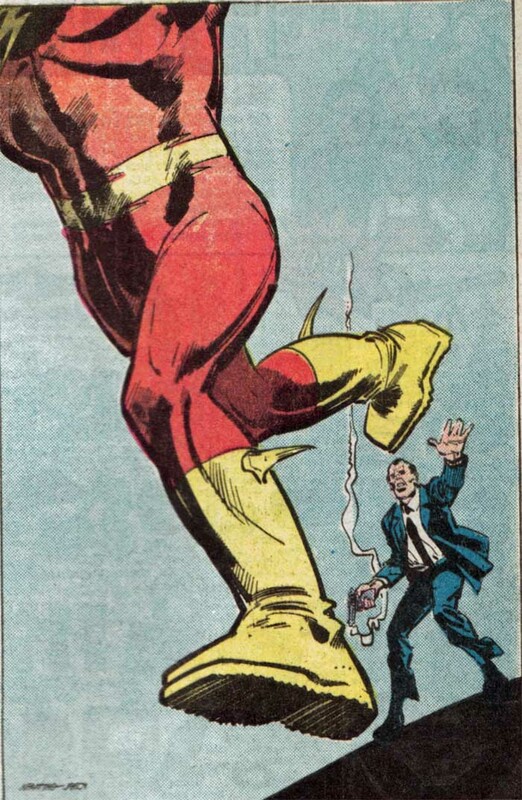 PG 4: Kid Flash retired in New Teen Titans #39 (Feb. 1984). The original art for this page can be seen here, via Comic Art Fans. The original art for page five can be seen here. [Infatino] explored these experiments in page design even further later in his career by trying full-page layouts without panels à la Will Eisner. Some of the best examples of this are in his work during the epic “Trial of the Flash” story, which ran from issue #323 to the series’ conclusion in #350. Augmented by the bold, clean inks of Frank McLaughlin, Infantino experimented with his page layouts and speedlines, pushing them to new levels of abstraction until they became a sort of kinetic shorthand for motion itself. Yet, even when pushed to those extremes, his linework remained clean, smooth and deliberate. If anything, these later issues demonstrate a well-earned assurance and show just how skilled of artist Infantino was as he pushed the language of the medium in new directions. Q: When you trip and fall, reflexes automatically command your hands and arms to reach out and break your fall. What if you were carrying a priceless object, say, a vase? Would you drop the vase in order to use your hands to break the fall? A: Within 10 to 30 milliseconds after tripping, the conscious motor centers of the brain would take control of the fall, weighing the chances of breaking the vase versus breaking your neck. You can modify the reflex action and keep a grip on the vase. PG 10: Check out this awesome Lego version of Barry Allen’s lab! PG 16: The only Fred P. Smithers I found was on a 1901 England census. PG 18: Here is the original camera (Exhibit A) confiscation scene. 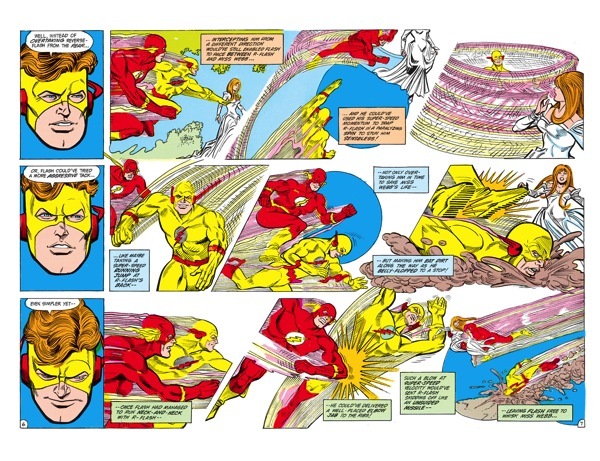 PG 21 & 22: Iris was murdered in Flash #275, but Reverse-Flash was not revealed as the murderer until issue #283. Bates’ “fun with names” continues when he calls Fiona Webb “Flora” on page 22. In the original issue, this preview image is included alongside the letters. Keep this in mind. See you next weekend! 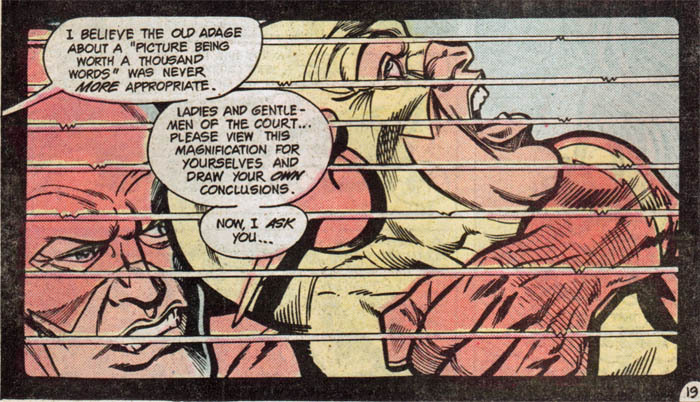 Strangely enough, this was the first time I read a comic with Barry Allen in it. What can I say? I was hooked.